Thanksgiving Energy Saving Tips from Bright Energy Services! As Thanksgiving approaches we at Bright Energy Services would like to wish our friends, family, and business associates a very blessed and safe holiday! Thanksgiving is just around the corner! While most of us have probably already planned the perfect feast, some of us are still finalizing our checklist for the holiday. As one of our biggest meals of the year, it should come as no surprise that Thanksgiving dinner calls for the most energy-hungry day for our kitchens. Bright Energy Services has assembled a list of Energy Saving Tips for you to stay energy efficient this Turkey Day! Turn down your thermostat a few degrees before you begin cooking. The extra heat from your kitchen appliances will compensate for your home’s furnace. Also, turn on ceiling fans to circulate air and distribute the kitchen heat throughout the house. Extra guests will also provide body heat for the dining room. An average person at rest is equivalent to a 100-watt space heater. Keep your refrigerator and freezer running economically by keeping the doors closed as much as possible to minimize the release of cold air. It is more energy efficient to open the door a few long times than it is to open and close it several short times, so take out what you need and keep it closed. Keeping your refrigerator and freezer full can save you energy because the cold items inside will minimize temperature rises when you open the door. Based on your recipes, identify side dishes that you can cook in the oven at the same time as you cook your turkey. The same amount of energy will be used to maintain your desired oven temperature no matter how much is in there. Filling up empty rack space will save you time and energy! Don’t open the oven door to check on the cooking status. Instead, place oven thermometers in your food and look at them through the oven window. Alternatively, set up timers for each dish in the oven. Opening the oven door unnecessarily releases heat which will increase cooking time and waste energy. Remember to use your small appliances whenever possible. Microwaves, toaster ovens, crock-pots and slow cookers are ideal for smaller food items. Bake, broil, grill, roast, sauté, steam, and stew a variety of dishes for up to 50% less energy than what your conventional oven would use. A load of dishes cleaned in a dishwasher uses 35% less water than by hand washing. However, if you fill the wash and rinse basins rather than letting the water run, you’ll use half as much water as a dishwasher. If you choose to use the dishwasher, wash full loads only and stop it before the heated dry cycle. Leave the door open to air-dry your dishes. Bright Energy Services was one of approximately 125 companies participating in the Westchester Green Business Challenge (WGBC) that were honored June 6 for their sustainable business practices. Westchester County Executive Robert P. Astorino and Dr. Marsha Gordon, President and CEO of The Business Council of Westchester, hosted the event at the Mapleton at Good Counsel Conference & Catering Center in White Plains and personally recognized these companies outstanding achievements. Founded three years ago as an innovative public-private partnership between Westchester County and The Business Council of Westchester, the WGBC is a 501c-3 non-profit designed to educate and inspire all Westchester County businesses to move down the path toward environmental sustainability while improving performance and saving money. 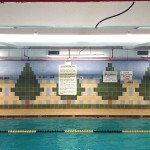 The Bedford-Stuyvesant YMCA was founded in 1888 to cater to a then fast-growing community. It has since steadily expanded into today’s 65,000 square-foot facility, providing a multitude of programs committed to promoting healthy living for its members ranging from toddlers to seniors. 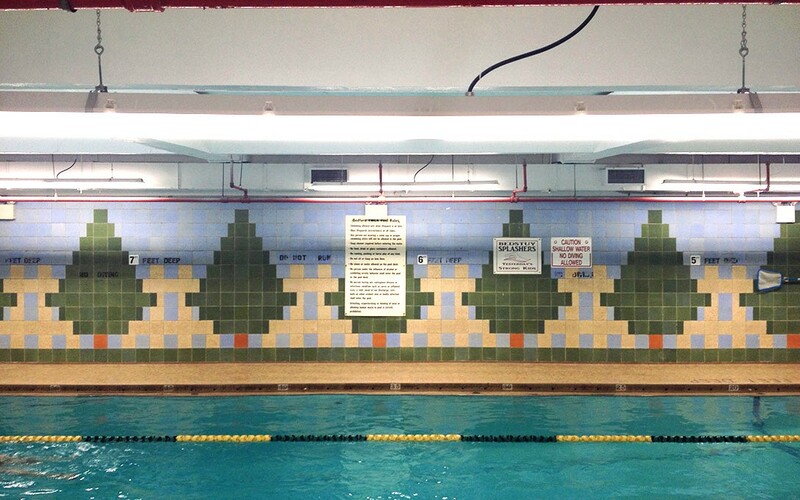 Determined to maintain operational sustainability, the Bedford-Stuyvesant YMCA recognized the need to upgrade its lighting in the pool and surrounding areas. Situated in the lower level, the space receives minimal natural daylight and thus requires a significant amount of artificial lighting power. Upgrading to more energy efficient equipment was the logical step to take. The Property Manager, Felix Gonzalez, decided to contact Bright Energy Services to help him meet the challenge. Bright Energy Services is no stranger to the YMCA of Greater New York. 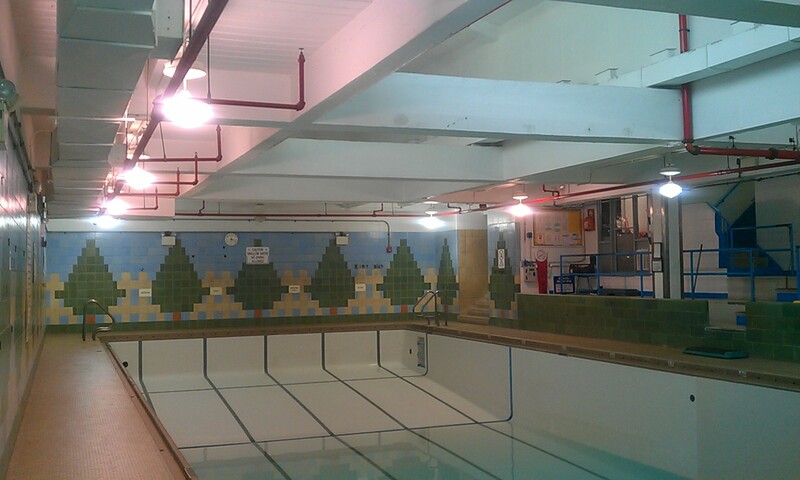 Bright Energy Services successfully upgraded the lighting in two major sections of the McBurney YMCA facility last year, and is currently in the process of retrofitting six more branches around the city. Bright Energy Services performed a lighting audit and presented an energy analysis and a financial analysis to Gonzalez. Bonnie Hagen, COO of Bright Energy Services, recommended replacing the existing fluorescent, high-pressure sodium, and incandescent lamps with LED (light emitting diodes) lamps. Hagen explained, “LED lighting has come a long way technologically and significantly reduces energy load, and therefore, energy expenses.” Gonzalez reviewed the analysis and determined that, “With better light quality and a longer life cycle than traditional fluorescents, it just makes good financial sense to upgrade to LEDs.” Dordy Jourdain, the branch Executive Director, agreed. “This energy savings project is aligned with our mission to improve health and well-being. Reducing our energy load helps to reduce emissions, creating a better environment globally”, Jourdain explains. He gave the go-ahead for the proposed retrofit, and the project was commenced. 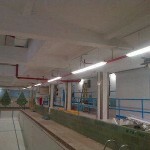 Bright Energy Services selected the best LED products to use for the facility as well as the installation team. The LED T8 light tubes are becoming a more viable lighting alternative for projects that require energy savings and proper lighting level. 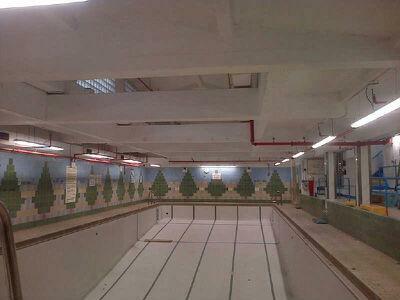 “We are pleased that the Aleddra LED T8 met the requirements set by Bright Energy for the YMCA project” stated R.B. 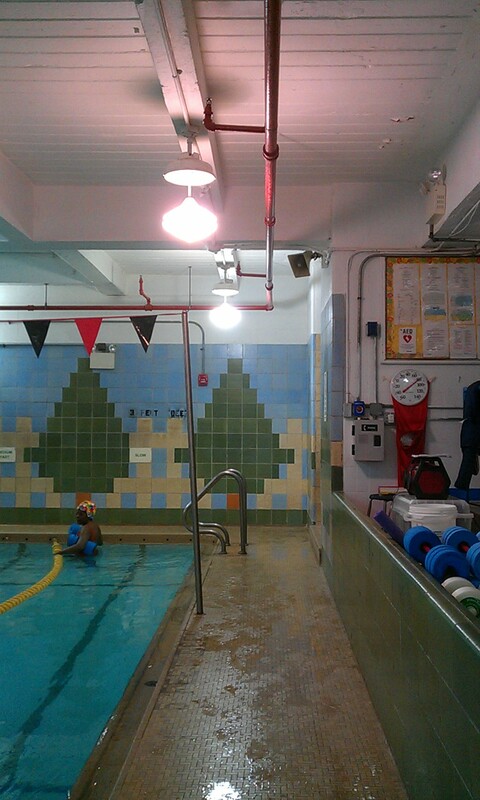 Evans, National Sales Manager at Aleddra, “more facilities, like the YMCA are asking about the LED T8. Having a partner such as Bright Energy Services, locally to make the proper evaluation and balance the needs of the occupant between energy saving and lighting level is why this project is as successful as it is. 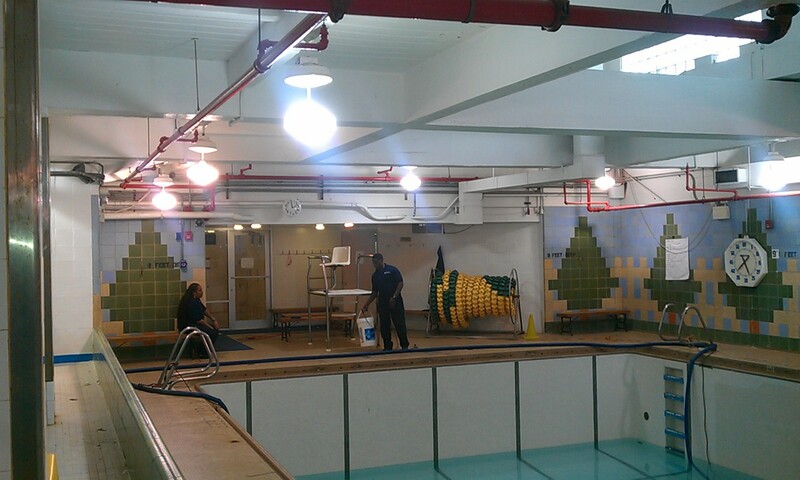 The staff at Bright Energy have done an excellent job for the Bedford-Stuyvesant YMCA.” Bright Energy Services managed the project from start to finish, coming in on time and on budget. The 14 high-pressure sodium lamp fixtures which were 480 watts each were changed to 1X8 LED lamp fixtures which are 102 watts each. 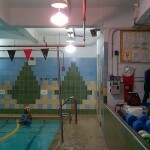 3 wall mounted 180 watt wall pack fixtures were changed to 50 watt LED wall pack fixtures. 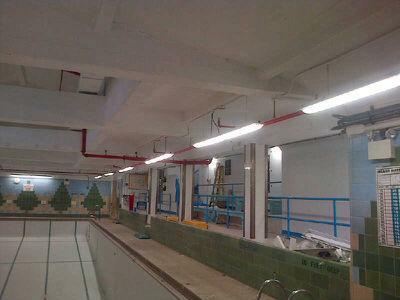 The fluorescent T8 77 watt fixtures and the fluorescent T12 96 watt fixtures were changed to LED 68 watt LED fixtures. 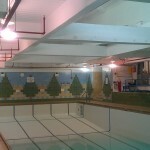 The yearly savings in the pool and adjacent areas is approximately 50,000 kWh and $10,100, or 78%! There are other financial benefits to moving to LEDs that are hard to quantify. LEDs burn cooler, so the heat load is reduced, also reducing cooling costs. LEDs do not use ballasts, so ballast replacement costs (ballast and labor) now become zero. Life expectancy of LEDs are 5-10 years, so replacement product and labor costs are also reduced. Because of the significant kWh savings, Bright Energy Services applied to Con Edison and NYSERDA for an energy efficiency financial rebate which is expected to come in at approximately $6,000. With the rebate and energy savings (not to mention the reduced operational expenses), the payback period is just over one year! Property owners across New York City are scrambling to get their buildings in compliance with Local Law 87. Every year, 1,300 to 1,500 buildings are responsible for submitting a comprehensive Energy Efficiency Report (EER) to the City. A total of 1,420 existing buildings are rapidly approaching their December 31, 2013 deadline and must be in compliance with the law. Those that do not meet their deadline will be subjected to fines of $3,000 the first year and $5,000 for each additional year of non-compliance. If you are unsure whether or not your building must comply, simply consult the full list here. Buildings with simple configurations such as warehouses or are occupied by extensive open spaces such as gymnasiums would be easier and compliance within this calendar year is still very likely. However, compliance may be problematic for buildings with complex systems or with many rooms such as office high-rises and multi-family complexes. The more complex a building, the more tedious the work will be for contractors, and the longer the process will take. Furthermore, depending on seasonal considerations and the extent of any deficiencies it can take up to 18 months for the final EER to be assembled. In any case, property owners should aim to pursue compliance as soon as possible. All buildings subjected to the law are required to submit an EER every 10 years based on their tax block number. Early compliance is recommended and will not reset a property’s next compliance to an earlier date. There is good news for those who cannot meet their 2013 deadline. Time extensions are available if a building is unable to complete the energy audit and retro-commissioning despite good faith efforts, or if a building is suffering from financial hardship as defined by the law. Time extensions must be filed by October 1st of the year the EER is due. However, there is a catch. The city has not yet made available a mechanism by which to file for an extension. The Local Law 87 compliance process comprises two components. The Energy Audit component requires interviews with operating personnel and a thorough review of utility bills and other operating data as well as detailed analysis of energy consumption for each base building system. The Retro-commissioning component enforces a building’s compliance with the list of 28 building operation measures specified in the law and required to rectify any deficiencies and noncompliant issues. Property owners are ultimately responsible for complying with the law, but selecting a qualified energy auditor and retro-commissioning agent (who must not be a member of the building staff) can be difficult. Bright Energy Services can help guide you through the entire Local Law 87 compliance process. Our team of certified auditors and commissioning professionals will get the most out of your energy audit by implementing low and no-cost recommendations and will make the best of your retro-commissioning by rectifying issues and implement energy efficiency upgrades, all while consulting your building staff. Bright Energy Services will file all relevant paperwork and if your facility is eligible for any rebates, will handle the paperwork and help secure the incentives available to help offset the expenditures for these projects. A rapidly growing number of businesses are receiving checks for thousands of dollars, month after month, from a most unexpected source…their electric supplier (e.g. a local electric utility). In return for helping the electric supplier reduce the cost of supplying electricity, the businesses receive a substantial portion of the savings through programs broadly referred to as “Demand Response”. Entirely different from energy efficiency or energy-saving measures, Demand Response programs provide an immediate and ongoing cash flow with no upfront investment. It also provides the resources large energy users need to reduce consumption, adhere to energy mandates, optimize operations, and achieve significant cost savings. For large energy users to participate in a Demand Response program and generate revenue for conserving energy above and beyond not paying for what was not used, they must agree to implement a plan for energy reduction when asked to do so by the utility. Since there is a correlation between high summer temperatures and the demand for electricity the high energy users are asked to curtail their energy usage for a few hours, usually on the hottest days of the year when energy demand is forecasted to exceed supply. When these energy curtailment events occur, they can last anywhere from one hour for a test to up to 8 hours for an actual event, helping to prevent possible blackouts and brownouts. The facility can be notified of an energy curtailment event up to 24 hours ahead of time, to allow the facility to prepare for it. The energy curtailment plan must be practical so that a facility can accomplish their Demand Response reduction goals. Most commercial and industrial businesses achieve their demand reduction goals by simply managing a portion of their non- critical electrical loads. For instance, they may adjust their HVAC setpoints from 68° F to 70° F, or shut down 5 elevator banks out of 10, or decide to transfer some of their electric load to a generator. Since each facility is different, each facility’s energy curtailment plan will be different. The more a facility curtails their energy load, the more revenue the facility generates. Many facilities use this extra revenue stream to fund other energy conservation related projects. For most businesses, participation in a Demand Response program is risk-free and as easy as figuring out how to use less electricity for a few hours each year. A variety of Demand Response programs are readily available in most of the major electricity markets. Contact Bright Energy Services today to learn more about how your facility can generate a revenue stream by participating in Demand Response. As the largest and one of the most densely populated cities in America, New York City is facing a very significant environmental danger – air pollution. Over 5% of deaths in NYC is attributed to contaminated air. One of the main pollutants in NYC is fine particulate matter (PM 2.5) which is responsible for over 3,000 deaths, 2,000 hospital admissions for lung and heart conditions, and approximately 6,000 ER visits for asthma every year. Nearly 9000 buildings, many among the wealthy neighborhoods of the Upper Manhattan, are still burning No. 6 or No. 4 heating oil today. This mere 1% of the city produces over 85% of all the soot pollution in the city, more than every motor vehicle on the streets combined. Air pollution and smog from combusting low-grade No. 6 and No. 4 heating oil is a cause of asthma attacks. Soot pollution can irritate the lungs, exacerbate conditions like asthma and increase the threats of heart attacks and premature death. In April 2011, Mayor Michael Bloomberg’s PlaNYC green initiative begun the phasing out of low grade heating oils in the NYC. Every building in the city will be required to stop burning No. 6 oil and must run on cleaner-burning No. 2 or No. 4 oil or on natural gas by July 2015. And by 2030, No. 4 oil will be phased out as well. Effective immediately, the city will deny any applications for #6 and #4 oil usage for new installations, and will instead have to use ultra-low sulfur No. 2 oil, natural gas, biodiesel, steam, etc. Starting July 2012, existing buildings that use No. 6 oil must convert to No. 4 oil or cleaner fuels before their three-year certificate of operation expires. Consequently, a complete abolition of No. 6 oil use by summer 2015 is expected. By 2030 or upon boiler or burner replacement, whichever comes first, all buildings must also stop burning No. 4 oil. The impact of these decisions on illnesses such as asthma and heart disease will be significant. Buildings with hot water boilers and burners using No. 6 oil have the low-cost option of first converting to No. 4 oil by 2015, or they can switch directly to No. 2 oil or gas. Buildings using No. 4 heating oil have until 2030 to switch to No. 2 oil, gas, or both. The DEP estimates the conversion from No. 6 to No. 4 heating oil will cost approximately $10,000, but much more for the conversion to gas. Buildings also have the opportunity to convert from low grade oil to both No. 2 oil and gas in an interruptible system. This option offers buildings the flexibility of burning whichever is cheaper at the moment. On the other hand, switching to an interruptible system may require installing a dual-fuel burner and other equipment that a system burning only No. 2 oil wouldn’t need. Firm gas systems also require new equipment, but utilities normally offer cheaper rates for firm gas service than they do for interruptible service. Con Edison estimates that 70% of the buildings in New York City burning No. 4 or No. 6 heating oil are situated within the service territory of its gas distribution network, and is continuously expanding into identified Area Growth Zones (AGZ). The rest would have to settle with converting to No. 2 oil, biodiesel, or steam due to the limited expanse of the gas network. Because of the high cost of an oil to gas conversion, compliance waivers and extended compliance schedules will be deliberated through the Department of Environmental Protection. But because natural gas is less expensive than oils for the same heating output, the average payback period will only be 2 to 5 years for a typical building. While switching from No. 6 to No. 4 oil is cheaper upfront, many buildings can save substantial sums in the long run by switching to the cleanest available fuel. To offset the significant upfront costs of moving to natural gas, Con Edison offers zero capital construction cost to buildings that lie in one of their AGZs. Con Edison will install the necessary gas service and/or main to your building’s property line with no capital construction costs to the property owner as long as they have only one gas service for the building’s gas load, use a firm gas service, and use Con Edison’s identified Point of Entry for the building. Furthermore, Con Edison and National Grid both have incentive programs for residential properties up to 75 units. Conversion rebates per unit and new-equipment rebates of up to $15,000 are available. Contact Bright Energy Services to help you secure financial incentives for these types of projects. Before you decide to make the switch to cleaner fuels, it is important that a qualified team of engineers and mechanical contractors first run an analysis of your building’s heating system. The data is necessary to determine the building’s current heating requirements and fuel consumption, the projected usage post-conversion, the expenses for new service and equipment, the estimated annual savings, and the expected payback period for the project. Call Bright Energy Services for your oil to gas conversion today! An energy audit is a systematic process of identifying the current equipment in a building, how much energy it uses, the cost to use that energy, and benchmarking it against other buildings of similar sizes and uses. An energy audit is a valuable tool for understanding energy consumption and the myriad of opportunities available for conservation of energy and energy dollars. Very often a building owner wants to save energy and money but doesn’t know where to start. An energy audit often directs the building owner/manager on the best way to approach the many options for energy conservation (i.e. cost, timing, impact, etc.). A complete energy audit will provide an estimate on savings, return on investment, and a reasonable payback period for any conservation measures or modifications proposed. If the energy audit is done correctly and the accompanying recommendations for modifications are implemented properly, the entire process will result in a reduction of the building’s carbon footprint and a corresponding reduction in annual energy expense. Some of these modifications may include the upgrade or installation of newer, more energy efficient equipment such as HVAC or lighting systems. Modifications may also include upgrades to the building envelope such as insulation or new windows. Depending on how aggressive the building’s owner/manager is regarding energy conservation, they may wish to incorporate some of the newer energy efficiency technologies such as photo-voltaic solar systems or geothermal systems. There are many financial incentives available for implementing these energy conservation measures. Energy audits come in different types and sizes depending on the organizational needs. Most organizations select an ASHRAE Level I, II, or III audit, depending on their budgets, how much equipment they have in the building, the age of the equipment, or the requirement of other agencies for code compliance or to grant rebate or incentive money. If your facility is located in the five boroughs of New York City and is 50,000 square feet or more, Local Law 87 mandates conducting an energy audit and performing a retro commissioning study of the base building systems. The intention of Local Law 87 is for facility owners and managers to have a tool to help improve the facility’s energy efficiency. 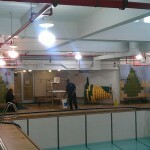 The process culminates with the filing of an Energy Efficiency Report (EER) with the NYC Department of Buildings. Starting in 2013, each facility is expected to comply during the appropriate time in a rolling deadline process. If your facility’s building block and lot (BBL) number ends in “3” the deadline for compliance is 2013. For facilities with BBLs that end in “4” the deadline for compliance is the year 2014, and so on. If you have a facility whose BBL ends in “3” and have not started the process to comply with Local Law 87, the time to start is now, as the process can be a lengthy ones Those that do not comply are subject to fines by New York City. What is a CSA? CSA stands for Community Supported Agriculture. A CSA is an alternative, locally-based economic model of agriculture and food distribution. A CSA is where a farmer offers a certain number of “shares” to the public. CSA members or subscribers pay at the onset of the growing season for a share of the anticipated harvest; once harvesting begins, they receive weekly shares of vegetables and fruit, in a box / bag / basket, and also sometimes herbs, cut flowers, honey, eggs, dairy products and meat, as well. CSAs generally focus on the production of high quality foods for a local community, often using organic or biodynamic farming methods, and a shared risk membership–marketing structure. This kind of farming operates with a much greater degree of involvement of consumers and other stakeholders than usual — resulting in a stronger consumer-producer relationship. The advantages are many. For farmers, they get to spend time marketing the food early in the year, before their 16 hour days in the field begin. They also receive their payments early in the season, which helps with the farm’s cash flow. This approach eliminates the marketing risks, costs for the producer and an enormous amount of time and labor, and allows producers to focus on quality care of the soils, crops, animals and co-workers as well as on serving the customers. There is financial stability in this system which allows for thorough planning on the part of the farmer. CSA members benefit as well. They get to eat ultra-fresh food (fresher than the supermarket) with all the flavor and vitamin benefits. CSA members develop a relationship with the farmer who grows their food and learn more about how food is grown. The relationships grow as members can see their farmer weekly during drop-offs, participate in “market days”, and members are usually welcome to make farm visits at least once a season. The environment’s benefit is quite simple- the minimal transportation required to transport food locally is a significant reduction of carbon dioxide emissions. Many CSA farmers also produce their food without the use of pesticides or inorganic fertilizers, so they are as natural as possible, limiting their impact on the environment. The environment also benefits indirectly through the elimination of the farm’s need for subsidies. Farm subsidies “can foster overloading of croplands, leading to erosion and compaction of topsoil, pollution from synthetic fertilizers and pesticides, denutrification of soils, and release of greenhouse gases, among other adverse effects. The growth of the environmental movement has certainly helped CSAs to grow. Concern for a healthy environment is the primary reason that CSA members join. Other primary reasons for belonging to a CSA are a desire to eat vegetables in season, source of organic produce, and support of local food sources. These reasons are all connected to the environmental movement, issues that pertain to sustainability and spending locally. The environmental movement also had large influence over the awareness of the issues surrounding pesticide use, which was likely a huge spark to the fast-growing fire of CSAs. It’s a simple enough idea, but its impact has been profound. Tens of thousands of families have joined CSAs, and in some areas of the country there is more demand than there are CSA farms to fill it. The Energy-Efficient Commercial Buildings Tax Deduction (CBTD), which was created by the Energy Policy Act (EPAct) of 2005 and extended by the Energy Independence and Security Act (EISA) of 2007, is scheduled to expire on December 31st of 2013. This special tax deduction rewards investment in energy-efficient improvements made to existing 1) building envelopes; 2) HVAC/hot water systems; and/or 3) permanently installed interior lighting systems. A tax deduction of up to $1.80 per square foot is available to owners or designers of new or existing commercial buildings that save at least 50% of the heating and cooling energy of a building that meets ASHRAE Standard 90.1-2001. Partial deductions of up to $.60 per square foot can be taken for measures affecting any one of three building systems: the building envelope, lighting, or heating and cooling systems. 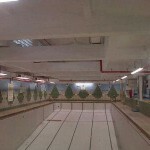 Deductions are taken in the year when construction is completed. While commercial building owners may be eligible to get tax deductions for these efforts, deductions associated with government buildings and not-for-profits are transferred to the energy efficiency vendor. The energy efficient technologies often implemented to secure the deductions include: Equipment Insulation, Water Heaters, Lighting, Lighting Controls/Sensors, Chillers , Furnaces , Boilers, Heat pumps, Central Air conditioners, Caulking/Weather-stripping, Duct/Air sealing, Building Insulation, Windows, Siding, Roofs, Comprehensive Measures/Whole Building, Tankless Water Heaters, Heat Pump Water Heaters, to name a few.